The Blu-ray debut of Chinatown, the 1974 Oscar-winning film starring Jack Nicholson (How Do You Know) and Faye Dunaway (Hurry Sundown), doesn’t come with any new special features, but the high-definition picture of the classic movie should be enough for the investment. 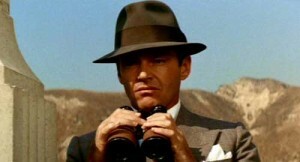 Directed by Roman Polanski (The Ghost Writer), Chinatown stars Nicholson as J.J. “Jake” Gittes, a private detective who’s hired by Evelyn Mulwray (Dunaway) to investigate whether her husband is having an affair. In the scandal that follows, Gittes discovers that the woman who hired him was not Mrs. Mulwray, and when the real Mrs. Mulwray is found dead, Gittes ends up in a web of deceit, murder and corruption. The R-rated movie was nominated for 11 Academy Awards, including Best Picture, Best Director, Best Cinematography and Best Actor and Actress for Nicholson and Dunaway. The crime film won only one Oscar, though, for its original screenplay by Robert Towne (The Firm). These extras were on the the Centennial Collection DVD edition released in 2009. All the DVD versions of Chinatown have been discontinued, although some can be found at some retailers.